Spouse/Partner: $35 all but T and card. please contact Dennis for further details. Includes: 1 all event pass, and 1 partner/spouse pass. extra- let me know what you need. hrs for the protection of your displays. details of what you need. have secure storage available for these items. Space is limited, confirm as soon as possible. Once again our Wednesday ride takes to the pavement. Only five of us make it out tonight and only two of us running fixed. We opt for a similar route as last week with a few more hills thrown in, most notably the ugly monster known as Ilchester that hits an 18% grade at one point. So steep I can barely turn over the cranks. I don't know if I was pedaling squares exactly, but it sure didn't feel like circles. The weather was nice and it was great to be riding in shorts and a light wool long-sleeve. After the mandatory bar stop the weather chilled but was still quite fine. Other than Jay's flat on the dark back road with no shoulder, things were pretty uneventful. Saturday brought more rain. Waves, buckets, large volumes in general. 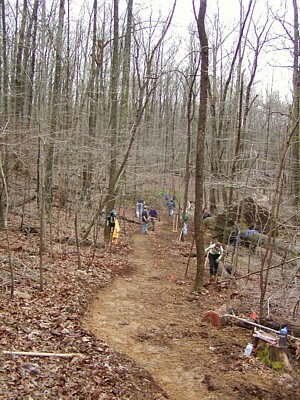 Cruised down to northern Virginia where the IMBA Trail Care Crew was teaching a trail building class. If you haven't been to one of these it's definitely worth it. The first half is classroom time, the second half trail work. I learned most of this in the past but it was a good refresher. All of this stuff is covered in the excellent IMBA Trail Building book, so grab it if you can't make it to a class. Of course, by the time we moved to the trail work another major storm moved in to really hammer us. The trails we went to work on had literally become streams thanks to massive run-off from a new building's parking lot shedding water straight into this watershed area. Trail liaison DT noted that the building in question is supposed to be one of those "green" buildings constructed with lots of recycled materials and whatnot. Looks like they overlooked some other environmental issues. We split up into a few groups to attack different problems, then finished with a couple of hours of bench-cutting some new trail once the rain finally stopped. The new trail turned out sweet, the downhill portion finishes in a nice rock garden and we used some buried rock to construct a fine jump as an optional line. Sunday saw our massive brew operation get back underway, been a bit since we fired up the kettles. Started the morning off right with some Dave's Insanity Bloody Mary Mix. That might just be the best Bloody Mary I've had. Tasty. Brewed up a couple of German ales this time around, a double Alt and a Kolsch, 24 gallons of malty goodness total. Keeping right in line with the usual brewing situation we got a little rain, a lot of wind and no sun. At least it was above freezing. Monday saw an easy spin on the pavement in the park with my lady. Trails are way to wet to even consider riding. We got something like 10 inches of rain in the last week and a half. Possibly more later this week. Off for some powerline/fire road adventure biking tonight in a desperate attempt to avoid more road riding but not destroy any trails.